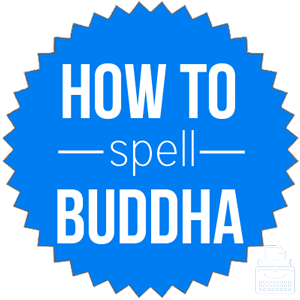 Spelling of Buddha: Buddha is spelled B-u-d-d-h-a. Since it is the name of a person, the first letter, “-b”, must be capitalized. Definition of Buddha: Buddha has a few senses, all of which relate to the religion of Buddhism. First, Buddha is known as the founder of the religion, Buddhism, and was originally known as Siddhartha Gautama. Second, it may refer to one who has attained Buddhahood, having achieved a state of perfect spiritual enlightenment and nirvana. Finally, Buddha is often used by itself to mean any statue or representation of Buddha. Pronunciation of Buddha: Buddha is pronounced boo-da. The “-h” is essentially silent and the “-u” is long. What does Buddha mean? Buddha is a proper noun as it refers to a specific being. Originally known as Siddhartha Gautama, Buddha now refers to the idol or deity being that is worshipped by Buddhists—those who subscribe to the truths of Buddhism. The Buddhist residents erected a grand temple for the worship of Buddha. He was not religious; he did not believe in or worship any god or deity – not Christ, not Allah, not Buddha. Less commonly, Buddha is also used to refer to an individual who has attained nirvana and achieved total spiritual enlightenment. Having attained nirvana and complete spiritual enlightenment, he was now a Buddha part of the Buddhahood. Oftentimes, Buddha refers to a representation of the Buddha, in the form of a statue or other image. The group of reporters gathered around the protestors in front of a reclining Buddha. The archaeological team uncovered a Buddha carved in bronze and dating to the 13th century. Buddha was first used in 1681, according to Merriam-Webster’s. The word is derived from the Sanskrit word, buddha, meaning enlightened, and is the past participle of bodhati, meaning he awakes. The word buddha is related to the Sanskrit word, bodhi, meaning enlightenment. Buddha refers to the prince Siddartha Gautama, the founder of Buddhism, and to one who has achieved ultimate enlightenment according to Buddhist principles. It may also refer to representations of Buddha. Being a proper noun, it has no synonyms.